The dumpy level originally designed by Gravatt, consists of a telescope tube firmly secured in two collars fixed by adjusting screws to the stage carried by the vertical spindle. 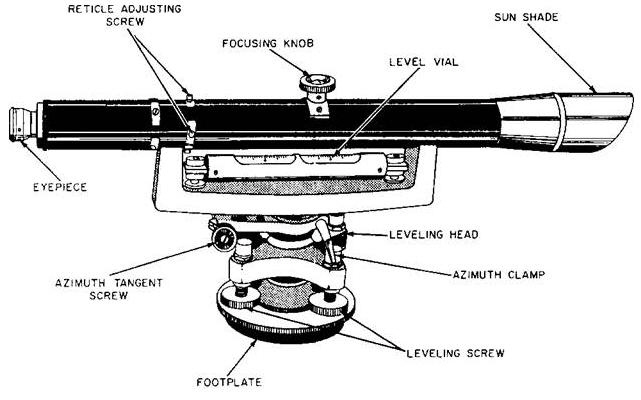 The modern form of dumpy level has the telescope tube and the vertical spindle cast in one piece and a long bubble tube is attached to the top of the telescope. This form is known as solid dumpy. Tripod Stand: The tripod consists of three legs which may be solid or framed. The legs are made of light and hard wood. The lower ends of the legs are fitted with steel shoes. Levelling head: The levelling head consists of two parallel triangular plates having three grooves to support the foot screws. Foot screws: Three foot screws are provided between the trivet and tribrach. By turning the foot screws the tribrach can be raised or lowered to bring the bubble to the center of its run. Telescope: The telescope consists of two metal tubes, one moving within the other. It also consists of an object glass and an eye-piece on opposite ends. A diaphragm is fixed with the telescope just in front of the eye-piece. The diaphragm carries cross-hairs. The telescope is focused by means of the focusing screw and may have either external focusing, or internal focusing. In the external focusing telescope, the diaphragm is fixed to the outer tube and the objective to the inner tube. By turning the focusing screw the distance between the objective and diaphragm is altered to form a real image or the plane of cross hairs. In the internal focusing telescope, the objective and eye-piece do not move when the focusing screw is turned. Here, a double concave lens is fitted with rack and pinion arrangement between the eye-piece and the objective. This lens moves to and fro when the focusing screw is turned and a real image is formed on the plane of cross-hairs. Bubble tubes: Two bubble tubes, one called the longitudinal bubble tube and other the cross bubble tube, are placed at right angles to each other. These tubes contain spirit bubble. The bubble is brought to the center with the help of foot screws. The bubble tube are fixed on top of the telescope. Compass: A compass is provided just below the telescope for taking the magnetic bearing of a line when required. The compass is graduated in such a way that a ‘pointer’, which is fixed to the body of compass, indicates a reading of 0 degree when the telescope is directed along the north line.In some compasses, the pointer shows a reading of a few degrees when the telescope is directed towards the north. This reading should be taken as the initial reading. The bearing is obtained by deducting the initial reading from the final reading of the compass. Simpler construction with fewer movable parts. Fewer adjustments to be made. Longer life of the adjustments.